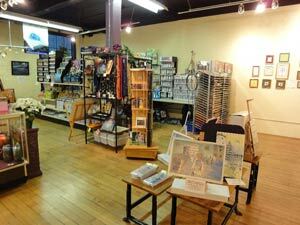 The Shirt Factory In Glens Falls NY - A Hidden Gem Awaiting Your Discovery! Off The Beaten Path & Filled With 60 Local Artists And Businesses! Looking for a place where the experience of shopping is as unique as the products offered? Look no further. The Shirt Factory is one of the best kept secrets in town! The historic building gives you the chance to buy from local artists and offers a great shopping experience! If you haven't heard of the Shirt Factory, you are in for a surprise! The historic building is more than meets the eye! It is filled with artist studios, shoppes, galleries and services. The Shirt Factory operated from 1902 to 1996. In 1999 the building became home to a business community of artisans, crafts people, healers and professionals, who chose to keep the simple, yet historic name. The building has been divided into many different suites. You can walk through 3 floors of vendors and experience the personal touch that each has to offer. You'll find a range of products made locally including candles, fine art, fine rustic furniture, jewelry, knitted bags and accessories, and teas to name a few! The Shirt Factory also houses trained specialists offering a range of services including acupuncture, art appraisals, interior design, healing arts, pottery classes, and yoga classes! Shopping locally is the thing to do these days! It allows you to find unique gifts and gives you the satisfaction of knowing that your money is going to a talented member of your community. The Shirt Factory is open all year long! Each weekend the shoppes are open Thursday through Saturday from 1-5 pm! For more information please call the Shirt Factory at (518) 353-2121.